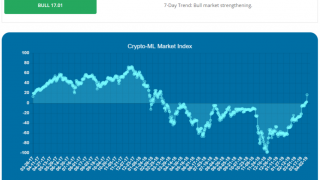 As Bitcoin prices continue to channel in a relatively narrow trading range, it’s good to have a solid understanding of how the Crypto-ML models view the situation and issue trades. This is especially the case when weighing the effects of small losses against larger wins. Individual trades need to be put in the larger context. 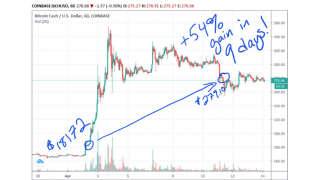 We discussed in How to Use Machine Learning to Trade Bitcoin and Crypto how the real “magic” in account value comes from following the trades and letting the account value roll forward to the next trade. If you look at the trade history, you will see numerous small losses that are then offset by large wins. By carrying the loss or win forward, your account value grows over time and the percentage wins have a bigger and bigger impact in real terms. This is a key concept and is fundamental to the objective of the machine-learning models we use. Our model’s goal is to maximize cumulative returns. In the chart below, you’ll see how Crypto-ML (the Auto-ML model specifically) is targeting breakouts. These two wins are punctuated by small, controlled losses in between as Bitcoin ranges between $6,200 and $6,500. A question that may be fairly asked is why isn’t the model capturing profit as Bitcoin trades in the range between $6,200 and $6,500? This range would allow for potential gains of just under 5%, which is actually quite good. But rather than capturing these trades, the model is looking for confirmation of an upward trend. When that trend fails to materialize, it exits the position, either for a fractional win or small loss. It’s not shooting for trades in this narrow range. The answer is that within the history of Bitcoin, it has simply been better to shoot for these large runs rather than trying to capture small wins. 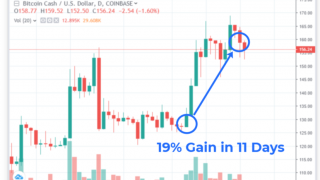 The risk of trying to capture wins in these narrower channels is that you’d lock in profit and then miss the remainder of a large, developing movement. If we zoom out on the same chart, you’ll see just how small that $6,200-$6,500 range really is. Further, you’ll see the scope of the dramatic speaks that have occurred even in the overall downtrend. By accepting small losses in the hunt for big moves, Auto-ML has been very effective at delivering exceptional returns in 2018 (see Auto-ML trade history here). 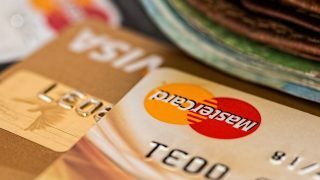 Since it has been running in late January 2018, it has delivered a 56% positive account return despite the 43% drop during that same time. This chart provides the same view but is cleaned up to show how small the blue trading range area is compared to the bigger picture. Will smaller trading ranges become the norm for Bitcoin? Once prominent trend absolutely stands out in 2018 and that is a narrowing of moves. Looking at the chart above, you’ll see the swings have compressed. Even the less dramatic days have compressed. The big question that remains to be answered is will we see narrowing continue or will we see a complete change in paradigm once price moves compress to a point? In traditional technical analysis, the narrowing is a signal of a pending large move. 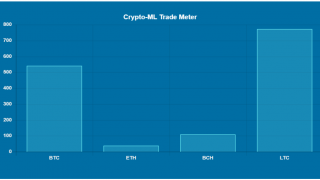 How can Crypto-ML handle smaller trading ranges? One of the limiting factors of machine learning is that it needs data. And it needs a LOT of data. The more information you provide, the better it can find patterns and make decisions. By analyzing data once per day, Crypto-ML Standard is limited in its ability to pivot quickly to new paradigms. In other words, to make a daily decision, you need to know what happens on past days–and you therefore need a lot of days to evaluate. That said, this isn’t necessarily a bad thing. It’s risky to assume paradigms will change frequently. 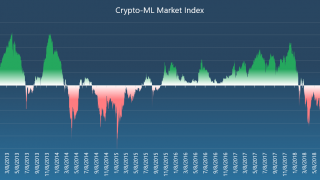 In fact, Crypto-ML Standard has performed exceptionally well (see Crypto-ML Trade History) precisely because it keeps the big picture in mind. It can certainly be argued keeping this historical context in perspective and not changing frequently will deliver the most consistent results and is the best long-term option. But since we’ve introduced Auto-ML (learn more about Auto-ML), which monitors the markets continuously, we’ve found that it is very effectively adapting to the market changes that we’re facing. It is fed data throughout the day, giving it a vast array of data points to pull from in a very short time. It operates on a massively different time horizon than Crypto-ML Standard. What is a long history for Auto-ML is not for Crypto-ML Standard. Given the pros and cons of each, the Crypto-ML team is working on a hybrid machine-learning model that will culminate in a unified solution across the platform. This would be expanded to all supported currencies, which are currently BTC, ETH, BCH, and LTC. The simple usability of Crypto-ML Standard will be married with the intense data of Auto-ML. Ultimately, we will deliver the solution that can best find new ways to trade effectively. Please stay tuned for updates on this project. If you haven’t already, we highly recommend you read about Auto-ML and turn it on in your notification settings. If you are not yet a Crypto-ML member, you can learn more about Crypto-ML and sign up for the waitlist. And last, regardless of your trading strategy and system, it’s important not to expect wins every trade. Rather, it’s best to look at the bigger picture and cumulative returns.